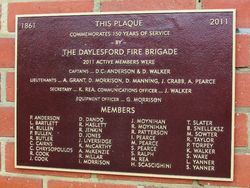 A plaque commemorates 150 years of service to the community by the Daylesford Fire Brigade 1861-2011. In 1861 at about 11 pm on Wednesday 23rd of January, The Freemans Hotel in Daylesford caught fire and in no time at all, the wooden part of the building was completely destroyed. 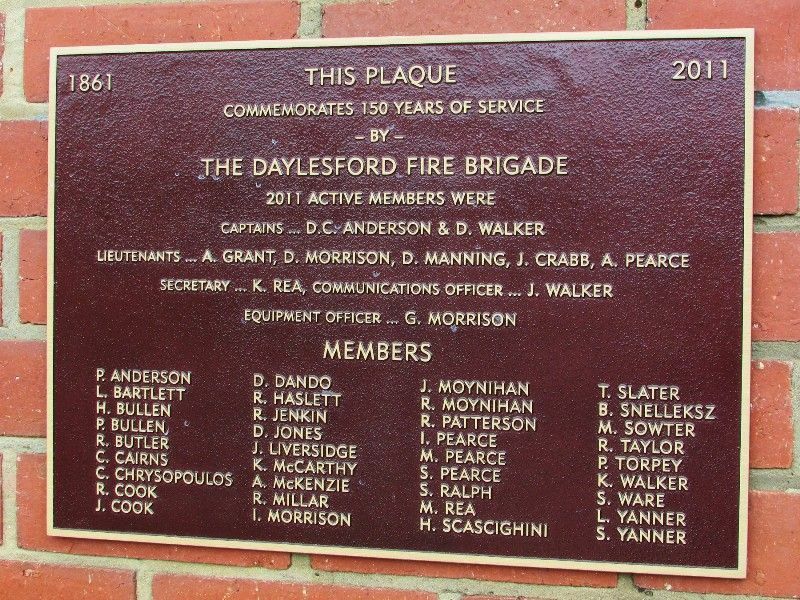 That Friday in a letter to the Daylesford Express, Mr J H Lerich suggested that an “organisation” should be set up in Daylesford to fight such fires – and so the Daylesford Fire Brigade was born. 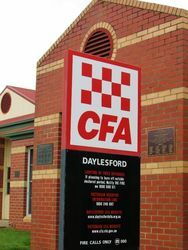 On Friday March 10 the Daylesford Express reported that a meeting had been held to form a fire brigade and a committee was appointed. The first monthly meeting was held in May of that year and in the absence of Captain Henshaw, Lieutenant Birten presided. An engine house was proposed with a warning bell, the station cost without a bell was quoted at £50. The first Fire engine was purchased from Williamstown Council for the cost of £100 complete with 250 feet of leather hose. At this time the brigade consisted of 15-20 men and 6 ‘light’ boys who ran ahead of the brigade at night to light the way.